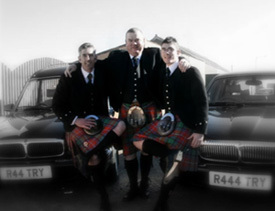 The senior member of the team and founder of the business Graham (middle), started the company from humble beginnings in 1993. He was then joined by his brother Martin (left) in 2007, with Martin's son Ryan, the latest member of the family to join, starting on a full time basis this September. Together, they form a highly motivated and professional team, who offer any potential client unrivalled commitment and service. 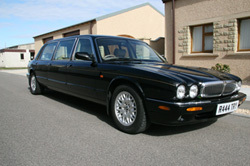 Our funeral vehicles consist of a traditional black Daimler hearse above and a Jaguar limousine below. 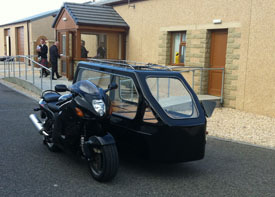 As an alternative to our motorised vehicles above, we can also offer to provide your loved one with a send off in a traditional and very beautiful horse drawn hearse. One for the Bikers. 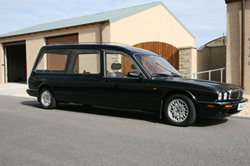 The latest addition to our fleet of vehicles will offer your loved one the most fitting of final journeys.